National CRNA Week was held Jan. 22-28 across the nation. 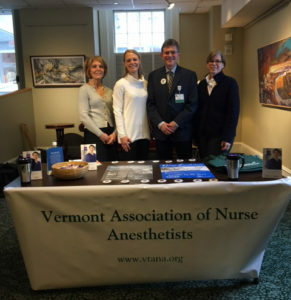 In Vermont the VTANA held its annual Legislative Day at the Vermont Statehouse. 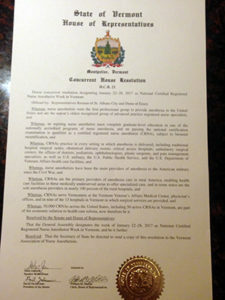 The Vermont House of Representatives recognized the work that CRNAs do in Vermont with a Concurrent House Resolution that also honored National CRNA Week. VTANA members helped distribute important information to lawmakers during the event. Left Photo, from left: Kim Cotnoir, CRNA; Tenylle Critchlow, CRNA; John Stitt, CRNA; and Nicole Stone, CRNA. The House Resolution is pictured on the right. National CRNA Week is AANA’s annual celebration of anesthesia patient safety and the nation’s 50,000+ CRNAs and student registered nurse anesthetists who safely and cost-effectively provide approximately 43 million anesthetics each year. 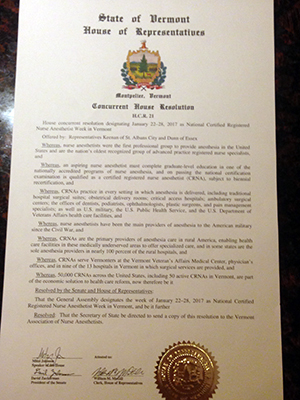 Known as National Nurse Anesthetists Week as recently as 2014, the new name for this popular event helps patients, hospital administrators, healthcare professionals, policymakers, and others become more familiar with the CRNA credential and the exceptional advanced practice registered nurses who have earned it.